The Nation’s Space Program is a mess…….. The Space program in general …and NASA in particular is still jobs and money….. 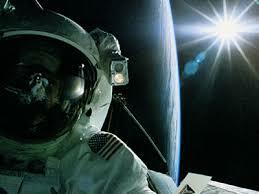 Most of us would gladly cut the balls out of the space program…..
Really, why would you spend money going to the Moon? While it has been done….and is a great technical achievement…..
It’s spending billions to fly to a rock in space….period! Obama is supposed to do this….. In an announcement to be made at the Kennedy Space Center in Florida, the president will personally talk for the first time about the sweeping upheaval of the National Aeronautics and Space Administration’s human spaceflight program outlined in his 2011 budget request: canceling the current program that is to send astronauts back to the Moon, investing in commercial companies to provide transportation to orbit and developing new space technologies. Mr. Obama’s budget request called for the cancellation of Orion crew capsule, which was to be used to carry astronauts to the International Space Station and then to the Moon, as well as other components of the current program known as Constellation. The president will propose that a simpler version of the Orion be used as a lifeboat for the space station. Russian Soyuz capsules currently provide that function. Because the Orion lifeboat would not carry astronauts to the space station, it could be launched on existing rockets. The official said Mr. Obama would also announce that he would commit to deciding in 2015 on a design of a heavy-lift rocket for NASA. 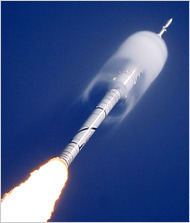 “This means major work on the heavy-lift rocket at least two years earlier than Constellation,” the official said. Astronauts would leave Earth orbit in the early 2020s, the official said, destined for the Moon, asteroids and eventually Mars. Mr. Obama will also announce $40 million devoted to helping Florida adjust economically after the retirement of the space shuttles, scheduled for this year. I just read that all the money spend on the Orion was for nothing but a striped down version to be used as a life boat for the International Space Station. I happen to think that the Shuttle should not be taken out of business..but should updated….. If the president can ride in 30 year old Marine One helo’s….. why not retro fit the Shuttles’? Oh, yea…..look for a BIG Frigging fight from Congress on this……. The Nation's Space Program is a mess……..
Space Shuttle “Discovery” blasted off this morning on a bright Monday at 6.21pm ET from the Kennedy Space Center. The Shuttle is now safely in Orbit. On Board are 7 Astronauts including one Japanese Woman. Assisting Commander Alan Poindexter is James P. Dutton who is one of the youngest Astronauts ever serving as Pilot. With seven astronauts on board, Discovery raised the number of spacefarers to 13. On Sunday a Russian Soyuz capsule docked with the ISS, delivering NASA astronaut Tracy Caldwell Dyson and Russian cosmonauts Alexander Skvortsov and Mikhail Kornienko to the orbiting facility where three more station crew members awaited them. Early Wednesday Discovery will dock at the forward end of the Harmony pressurized node, kicking off nine days of joint operations between the two massive spacecraft. In addition to moving 6,700 pounds of cargo out of Leonardo, and then refilling it with scientific samples, worn-out gear and other “down mass,” the two crews also are scheduled to conduct three spacewalks to replace an ammonia-coolant tank and a gyro, and install a camera on Canada’s “Dextre” robotic dexterous manipulator in preparation for a robotic repair this summer. NASA get’s flack from Congress on the Manned Space budget……..
Here’s a piece about the situation…..
NASA’s proposed policy turnaround faces stiff bipartisan opposition in Congress, which twice authorized the George W. Bush administration’s Constellation program with bipartisan support. In back-to-back Senate and House hearings by the NASA authorizing committees this week, members from both parties sharply questioned Administrator Charles Bolden about the new plan he was defending. No lawmaker in either hearing endorsed the change. Objections to it fall into two broad categories — the lack of a clear objective in space for the new program, and the “faith-based” belief, in the words of one House member, that a commercial route to orbit for U.S. astronauts is better than the government-managed Ares I and Orion vehicles. Members also are irritated over delays in getting specifics of the broad-brush plan released Feb. 1, and the apparent lack of consultation outside a small administration circle in the decision to make such a “radical” change away from a space policy Congress has endorsed. “This is a dangerous path that not only threatens our leadership and our highly skilled work force, but also threatens the very existence of America’s human spaceflight efforts, and the utilization of the International Space Station,” said Rep. Ralph Hall of Texas, the ranking Republican on the House Science and Technology Committee. Sen. Bill Nelson (D-Fla.), chairman of the Senate subcommittee that authorizes NASA spending, said Feb. 24 he wants Bolden to find a way to continue using the Ares I crew launch vehicle as a test bed for future Earth-to-orbit transportation technology, even if NASA shifts to reliance on commercial vehicles for crew transportation to the space station. Nelson, who strongly backed Bolden for the administrator’s post, suggested that the $2.5 billion in NASA’s Fiscal 2011 budget request for terminating Constellation contracts could better be used in additional technology research. Florida stands to lose 7,000 space jobs when the shuttle fleet is retired after four more flights, and Nelson complained that abruptly canceling Constellation as well deprives his constituents of at least a chance at replacement work. “We simply must do right by the men and women who have made this space program great,” Nelson said. NASA get's flack from Congress on the Manned Space budget……..
NASA’s Budget get’s clipped…no moon trips… Commerical transportation and shareing with other nations will be the future….. The ambitious space initiative that President Obama unveiled for the National Aeronautics and Space Administration on Monday calls for sweeping changes in mission and priorities for the 52-year-old agency, yet it omits two major details: where the agency will send its astronauts and a timetable for getting them there. If Mr. Obama’s proposed budget is implemented, NASA a few years from now would be fundamentally different from NASA today. The space agency would no longer operate its own spacecraft, but essentially buy tickets for its astronauts on commercially launched rockets. It would end its program to return to the moon and would pursue future missions to deep space by drawing more cooperation and financing from other nations. As expected, Mr. Obama’s proposal seeks to cancel the Ares I rocket, in development for four years as a replacement to the space shuttles. More unexpected, the request also would kill Orion, the crew capsule that was to sit atop the Ares I. The Orion is the only spacecraft in development that would be capable of traveling beyond low Earth orbit. Over all, Mr. Obama’s request would add $6 billion over five years to the NASA budget. The agency is projected to receive $100 billion over the 2011 to 2015 fiscal years. 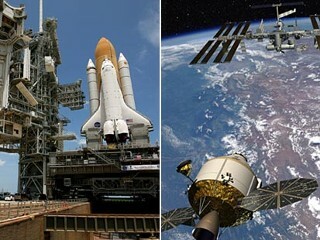 Whether Congress agrees to the restructuring of NASA remains to be seen. After spending $9 billion on Constellation, the program to return to the moon, canceling the contracts with Boeing, Lockheed Martin, Alliant Techsystems and other companies would cost an additional $2.5 billion, NASA officials said. The Dog is generally happy with these decisions….. The Orion program is a move backwards……sending Us Astronauts into space in a modified phone booth is asinine…..If NASA can’t do it safely then why not turn to commercial companies? Millions of people fly around the globe on commercial aircraft…why can’t NASA? Why in hell do we want to spend money to go to the friggin Moon when we need money for more basic things? This a change in direction that has been long in coming…I give the President props for his proposals…now…. Can Congress keep the lid on this spending?